Aleksander Guschin, political analyst, deputy head of the department for post-Soviet countries at the Russian State University for Humanities, has answered EADaily’s questions on the developments in the Commonwealth of Independent States (CIS). What impact have the Russian Spring events of 2014 had on integration relations within CIS: was it positive or negative? Despite importance of the events in Donbass, I don’t think they have had any fundamental impact on integration processes in the post-Soviet area. Yet before those events the post-Soviet area was a territory of two trends – disintegration and integration processes and the first prevailed over the second. I mean national elites in newly independent states tried to gain a foothold not only inside their countries but also to ensure legitimacy and power with the support of foreign actors. Evidently, the interest to the CIS today and yet before events in Donbass was not as high as it was in 1990s. To a large extent, it was connected with new more active integration projects (CSTO or EAEU) that emerged in the area. Speaking of how successful the CIS is, one should admit that prevalence of negative assessments is normally justified. The CIS failed to overcome some trends, such as fragmentation of the post-Soviet territory, withdrawal of some states from the Commonwealth, differences in foreign policy orientation of member-states. Eventually, one can hardly call the region united today. Of course, there are some uniting factors, economic, social and cultural ones, but the term “post-Soviet area” raises more and more questions. The most important cementing element of this space is common agenda, including national and territorial conflicts emerging from establishment of de-facto states, but disintegration still prevails. I’d like to highlight another important fact – the Crimea events had certain impact on the situation in the Commonwealth by gradually cooling down the relations of the West and Russia. Evidently, third actors have gained stronger positions in the post-Soviet and CIS area. In regions like Central Asia, it is evident, or even if we look at Belarus and Ukraine (at a lesser extent) how they are trying to diversify their sales markets. 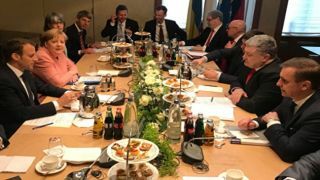 As to Ukraine’s course towards European integration, one cannot but admit that the Association Agreement of Ukraine and EU was a severe blow on the Russian-led integration processes. It is obvious that Eurasian Economic Union with Ukraine and without it is quite different. Loss of Ukraine’s industrial base had a very negative effect on the project, namely balance of raw materials and non-resource economy, foreign markets and total area of the project. Former government of Ukraine turned the policy of balance into a policy of trade and promises to partners. Eventually, that country has appeared at disadvantage. Nevertheless, there was a chance: they made an agreement under which a $3 billion tranche out of total $15billion loan was to be transferred and an action plan was approved to regulate restrictions in the bilateral trade of Russia and Ukraine for 2013-2014. Gazprom and Naftogaz signed alterations to purchase-and-sale contracts, natural gas supply volumes and transit terms dated January 19, 2009. Furthermore, they signed an agreement on government support to resume serial production of An-124 aircrafts, Protocol on supply of goods of industrial cooperation, Memorandum of Intentions to boost cooperation in ship building etc. However, the country has become an area of confrontation of two geopolitical poles. Today, Ukraine’s return to the idea of bridge, link, is out of question. Economy of Ukraine is not the same as before, agrarian processes prevail there amid deindustrialization and breach of industrial ties with Russia. On the one hand, statements by Petro Poroshenko are efforts to show his voters and the West that the country is finally leaving post-Soviet area. On the other hand, it is a desire to neutralize the influence of CIS. Russian spring in Crimea showed that Russia is ready to resort to extreme measures in case of any threat to security of its compatriots. That step grasped more attention to Russia’s interests in post-Soviet area. On the other hand, part of post-Soviet elites has become more cautious towards integration, assuming that integration projects involving Russia have what they call political motives. However, I do not think it had any determining influence, for instance, Eurasian Economic Union started actively developing after Crimea events, Customs Code was adopted recently. On the other hand, it has faced some serious institutional and trade issues. Nevertheless, the past year showed that despite sanctions and problems with the West, domestic trade grows and there is certain awakening, though failure to coordinate counter-sanctions with EAEU partners arouses questions. As for political integration, in the post-Soviet area one can speak of military and anti-terrorist dimension rather than foreign political one. There is an acute problem of political alliance and its comprehension, despite all smoothing arguments, and Russia has no sound political allies in post-Soviet area. There is military and political integration with Belarus, Union State, there is EAEU. However, there is no country that is ready to take its cue from its big neighbor Russia. Can we take it that China gradually gains Russia’s area influence in Central Asia and will become the regional leader soon? Central Asia really was and still is an important region for China, first of all, because of import of energy resources and the need to diversify that import and get sales markets for Chinese goods. Recently China has been actively making non-resource investments, specifically in economic zones in Uzbekistan and Tajikistan. They work to link such aspects as digital component of Silk Road and national programs of digital development. Trilateral agreements have been signed by Kyrgyzstan, Uzbekistan and China in area of freight activity. China occupies the first place by export from Turkmenistan and Kazakhstan. Besides large investments and trade turnover, there is something that makes China important – it does not influence political systems openly, at least so far, to change them radically, though there is high indirect influence. China has been increasing not only economic penetration into the region recently. For instance, private military companies are reportedly present in the region, and China actively develops educational and humanitarian programs of cooperation. It should be recalled that Beijing still supports bilateral format of cooperation, raising many serious issues concerning the success of EAEU-China and China-Russia coexistence in the region. Recent developments with the base in the Caspian Sea to ensure transit to Afghanistan and open rapprochement of Astana and Washington showed that U.S. is also an element of Kazakhstan’s multi-vector policy and it is an evident fact. Actually, the region’s countries will maintain their multi-vector policies and China’s influence will keep growing. Of course, local elites are concerned about China’s active penetration. Nevertheless, I think mass media sometimes show surplus idyll about all possible interactions, as it is highly possible that competition with China will just grow. Will Russia face any strongly negative moments with Ukraine’s withdrawal from CIS? President of Ukraine really announced possible withdrawal from CIS, but it is a selected approach, and for instance Kiev may try to maintain some elements of cooperation at least at the bilateral level. For example, relations with Belarus are especially important for Kiev. Government in Ukraine involves the people in discussions of many issues to distract them from real state of affairs. Pre-election aspect is also important. Petro Poroshenko’s approval rating is not good and he yields to Yulia Tymoshenko and some other candidates significantly. Hence, it is an element of election campaign to a larger extent. It should be noted that besides domestic rhetoric, they try to show the West that Ukraine strives to lead the countries in the region away from Russia and remain the West’s outpost at the same time. Besides, it is noteworthy that right-wing radicals press the government over withdrawal from CIS and actively criticize it for “failing to introduce” visa travel with Russia. Ukraine’s economy has changed greatly as compared to what it was 3-4 years ago. Economic relations with CIS countries have decreased dramatically. Ukraine is no longer a full member of CIS, though many agreements, for instance on pensions, mutual recognition of higher education certificates, are still implemented. I think Kiev will do its best to keep these agreements at the bilateral level. This resembles gradual withdrawal of Tbilisi from CIS. Russia does not care for Ukraine’s withdrawal from CIS much, as commodity turnover decreased dramatically, there is trade embargo. EAEU is a priority and more effective project in post-Soviet area unlike CIS. Russia will not feel any serious negative consequences, but this will cause certain damage to the project’s image. This is a signal to the political elites in CIS that are unfriendly to Russia that a West-oriented country and GUAM member-state Ukraine having 17% of export with CIS leaves it, though it has not traded with Russia on FTA terms for a long time already.